Aaron Scott delivered a five-star performance on Sunday as he won the Folksworth 15 for a record fifth time. Stamford-based Scott, who now runs for Lincoln Wellington AC, put the boot in early on as he started at a pace that the other contenders found too hot to handle. 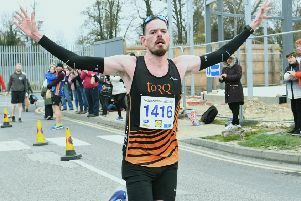 On a notoriously hilly two lap course, he increased his lead throughout the race finishing in 1:19.78, a minute down on the course record he set in 2014, but over two and a half minutes clear of runner-up David Hudson of BRJ Running Club. After collecting his winner’s trophy Scott pronounced himself pleased with his day’s work. He said: “Everything went to plan as I wanted to maintain effort throughout, which was more manageable this year thanks to the conditions being favourable. “I was still a minute off my course record from a few years back, but I was quicker than last year and I ended up running a marathon PB last year. “So all seems to be heading the right way. The 29 year-old has experienced the highs and lows of marathon running, but when he’s good he’s very good, and a PB of 2:19.18 set in London last year saw him positioned 11th in the national rankings for 2016. It was a good day at Folksworth for Bushfield Joggers with their fast men Phil Martin and Brian Corleys coming home fourth and sixth in 1:25.19 and 1:27.35 respectively. James Mogridge of host club Yaxley Runners was sandwiched between the Bushfield pair in fifth while his teammate Matt Launch finished ninth. PACTRAC triathlon ace Paul Lunn finished eighth, ducking under the 90 minute mark with a 1:29.23 clocking. Stamford Striders veteran Jim Morris finished 14th, winning the Over 50 prize in the process. There was a new name on the women’s trophy, with the highly promising Suzy West winning in comfort with a time of 1:38.17. West is not a frequent racer, but despite this is becoming highly respected on the local road racing scene. The 26 year-old set a new Eye Community Runners ladies marathon record in London last year, with a 3:02.55 clocking. Yaxley’s Caroline Woods was fifth lady, and recipient of the Over 35 veterans prize, mastering the hills in 1:42.59.
n Saturday’s Cambridgeshire County Schools’ Cross-Country Championships, due to take place at Ely, were cancelled due to the freezing conditions.